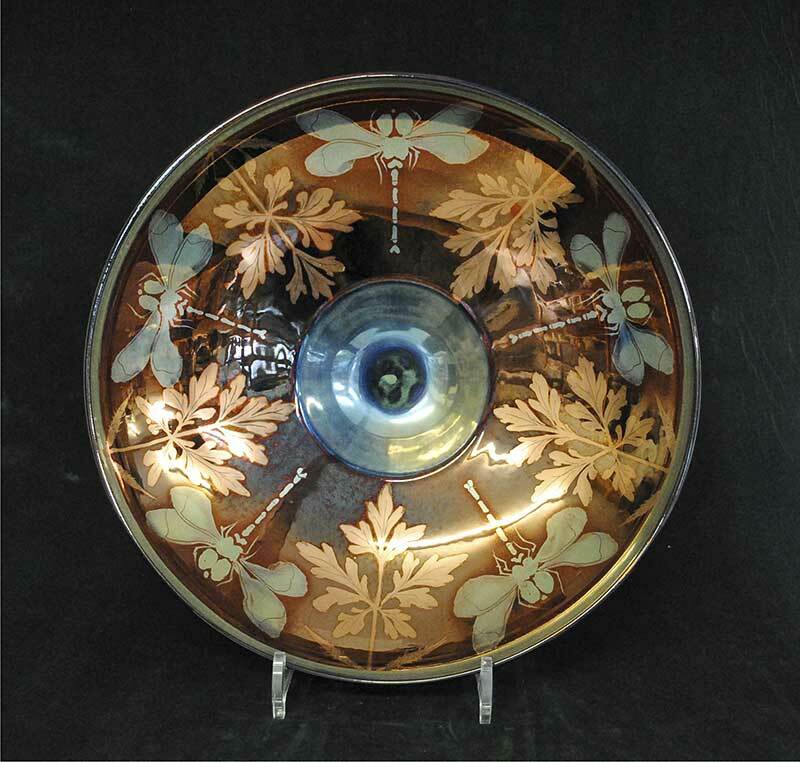 John has been making stoneware pottery in the North Lancashire village of Yealand Redmayne for forty years. 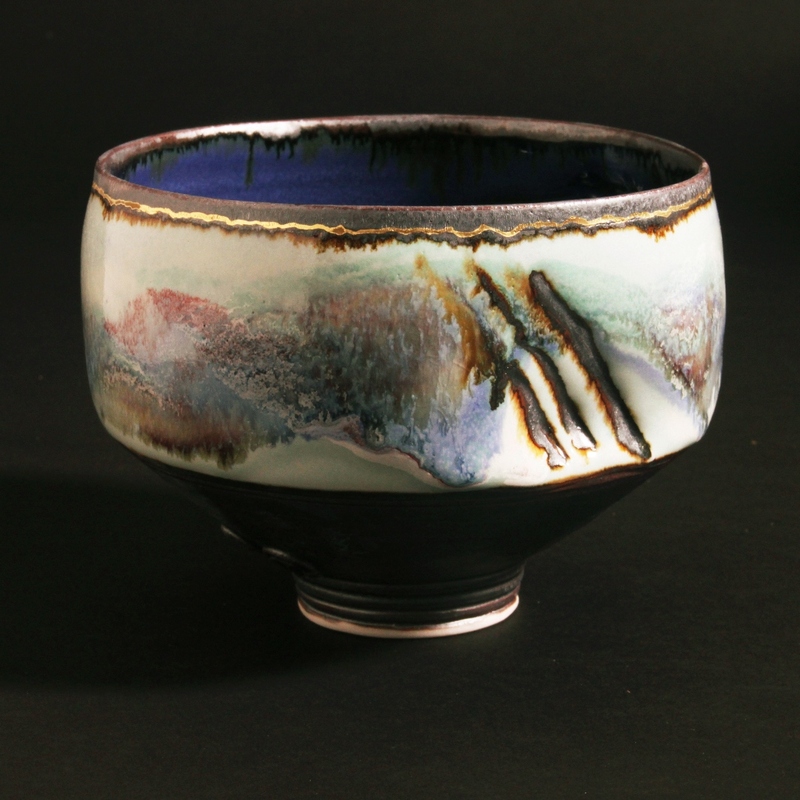 The firing process requires a temperature of 1320c, and a smokey/reducing atmosphere in the kiln, which results in rich glaze colours and exciting unpredictable effects on the pots. 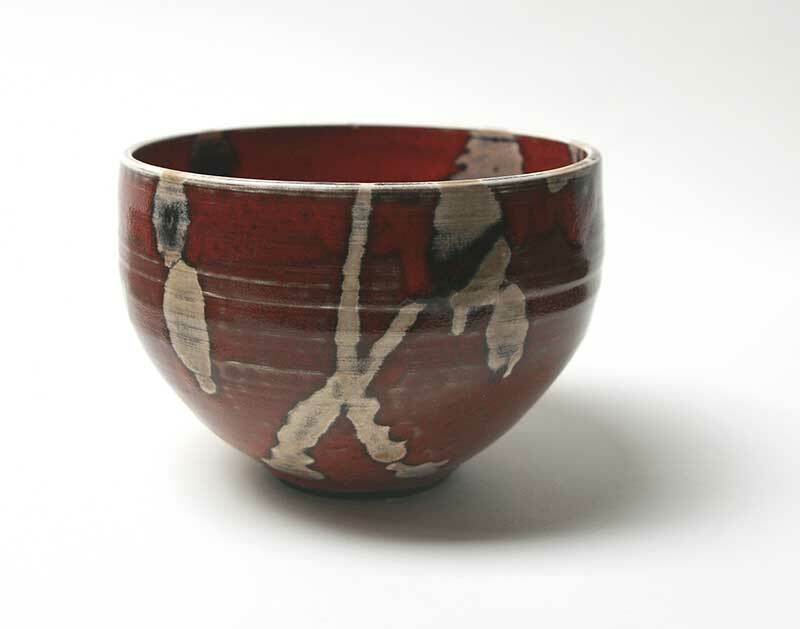 Most of the pots are classically simple functional shapes, thrown on the wheel, but John occasionally alters the freshly thrown pots to produce one of the signature forms for which he is well known. Since 1989 he has regularly exhibited and given workshops in Europe, North America, Australia, New Zealand, and throughout the UK. 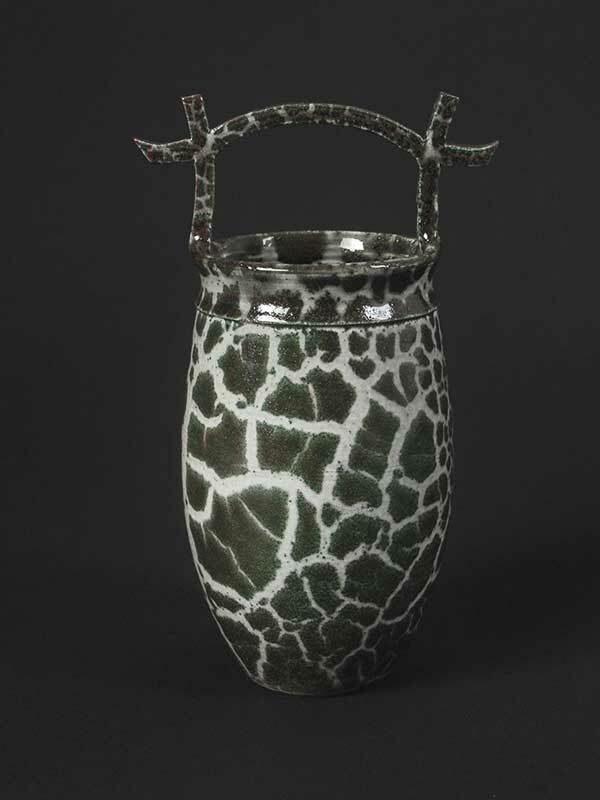 In 1990 John was elected a fellow of the Craft Potter's Association of Great Britain. 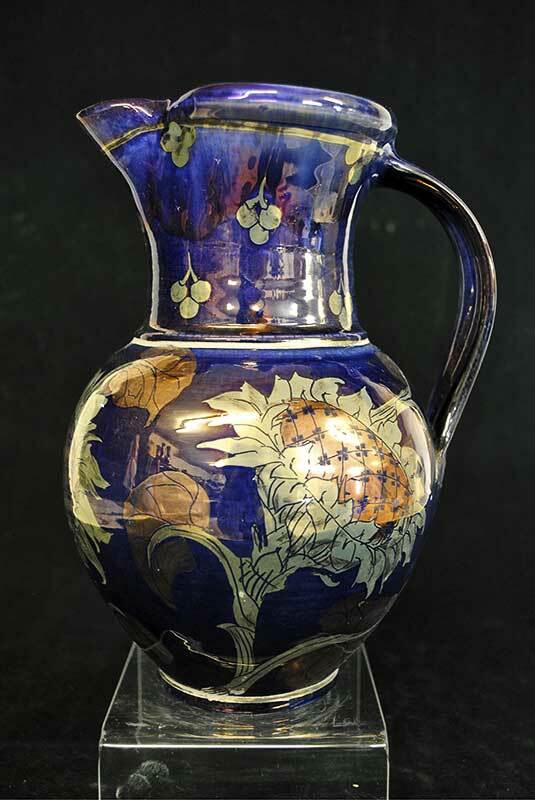 An apprenticeship in France and several visits to Italy introduced Daphne Carnegy to the delights of earthenware and in particular tin-glazed ware, often referred to as ‘maiolica’. Additional training at Harrow School of Art refined and developed her skills and confirmed her commitment to low-fired pottery. 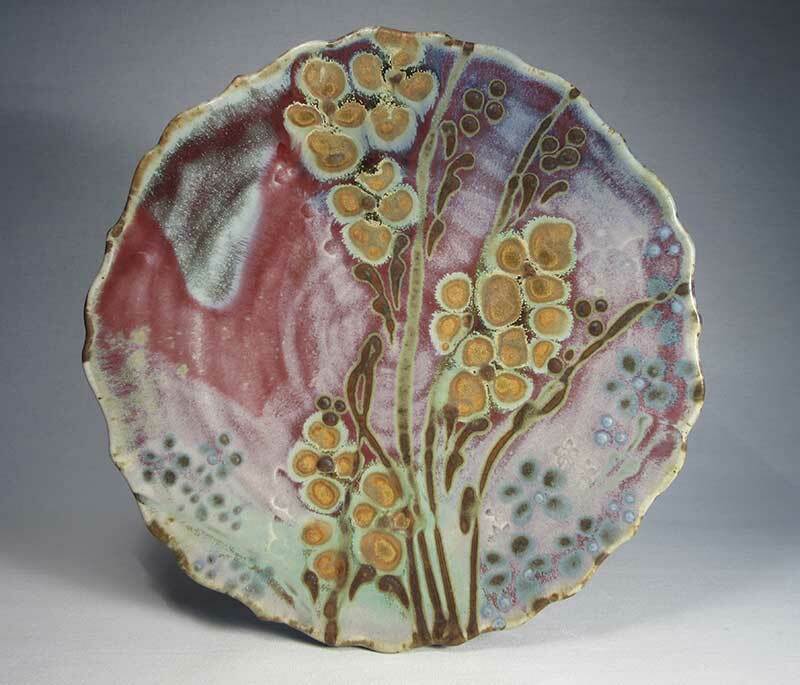 The attraction of maiolica for Daphne lies in its unique qualities - a softness, depth and luminosity of glaze and colour not to be found in other ceramic techniques, the transformation of the pigments in the firing, and the variations of intensity and texture of the pigments as they fuse and shift with the glaze. 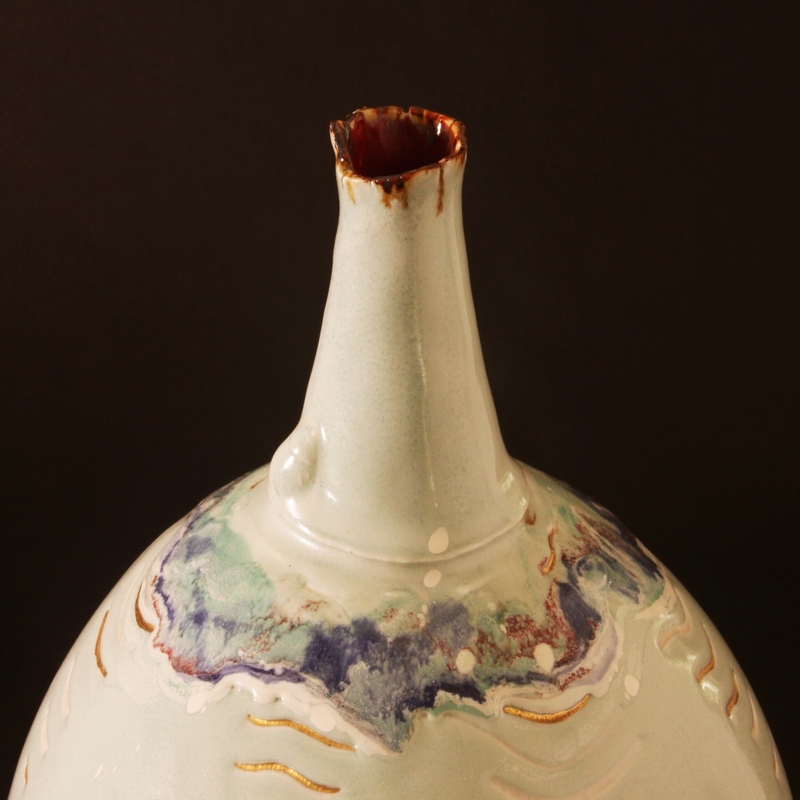 The many variable elements – body, glaze and pigment thickness, firing temperature – all conspire to create continual surprises on opening the kiln. 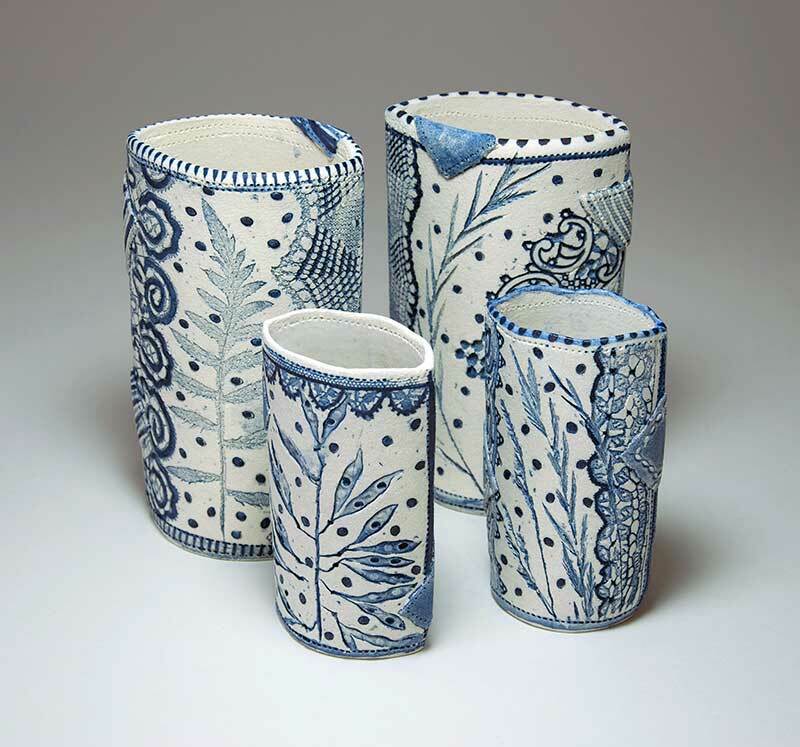 Daphne makes a range of thrown, and sometimes hand-built, painted tin-glazed earthenware which combine an awareness of historical precedents with her passion for plants. Author of the highly acclaimed Tin-glazed Earthenware (A & C Black, 1993), and Maiolica (A & C Black Ceramics Handbook, 2011). 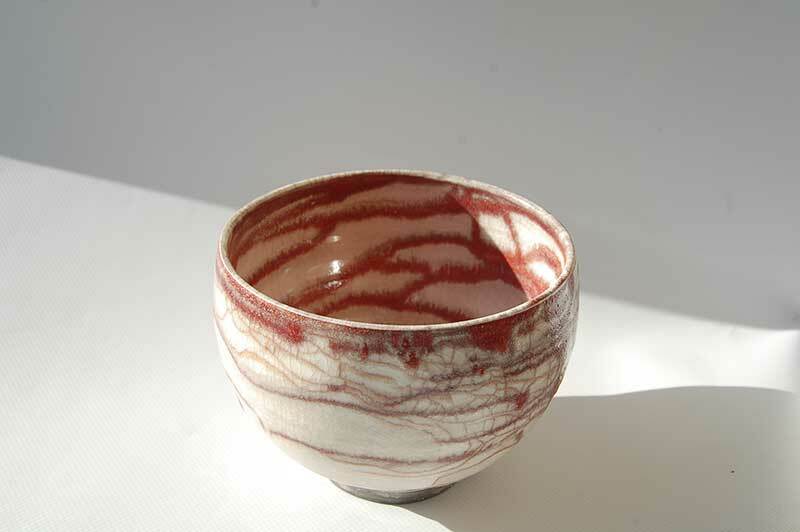 Technique : Hand built porcelain works, polished and fired in electric kiln. 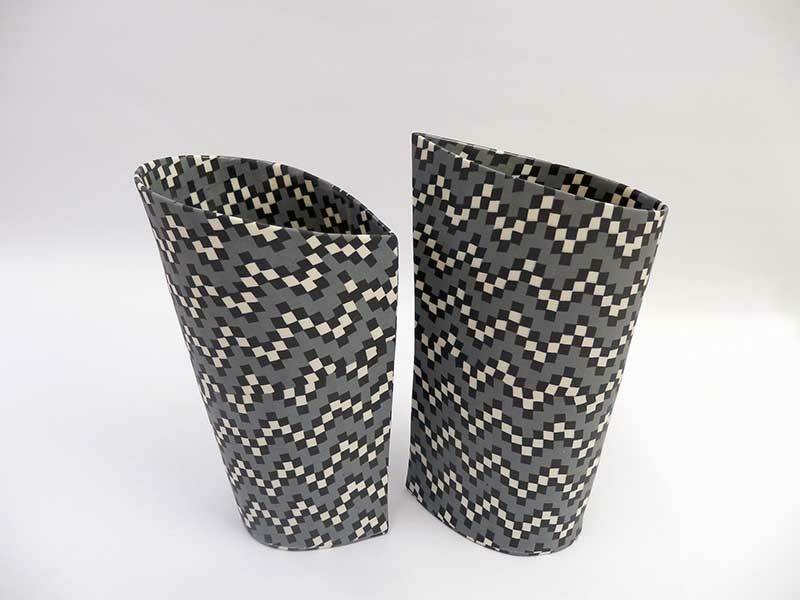 The decorative patterns are made by lamination technique: I start with a vision of the final pattern in mind, working backwards, decide how many sheets of different thickness of white, grey and black stained porcelain are needed to be cut and layered, in a special sequence to form blocks. These blocks are cut again into slices, along the side, at an angle, or at different thicknesses, and re-layered, to arrive at the desired block of pattern. Every block of pattern is unique and cannot be replicated. A thin slice is cut from the final block, rolled thinner to give an organic movement to the pattern, templates are cut out, and the piece is hand-built. 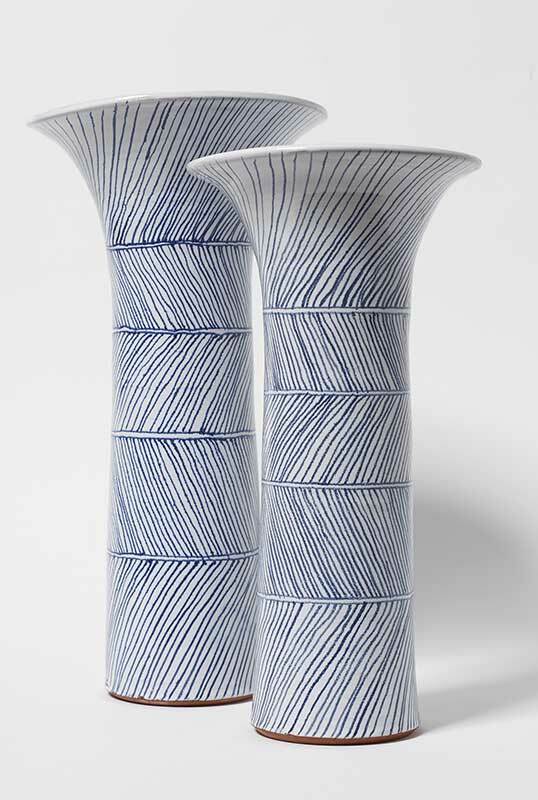 After all the cutting and layering processes, the final porcelain patterned sheet is very fragile, and highly prone to cracking after firing. On one hand the material is very fragile, on the other hand the patterns are lively and full of force. This is like what I observe in nature, water flows smoothly around corners and yet have tremendous power, flowers so delicate and come in million of shapes and colours, birds so fragile but fly swiftly and effortlessly everywhere. I am inspired by what I observe, I design my works to capture the lightness, the movement and the delicacy in nature that is so beautiful. 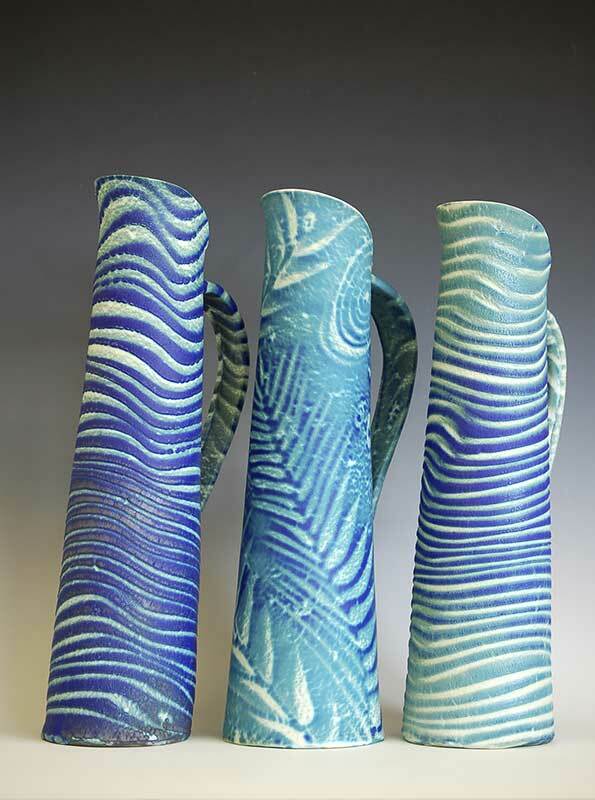 The forms and the vibrant patterns of my work attract the eyes, urge viewers to touch them, and be a pleasure to hold and use. Linda works from her studio at home in Winchester, Hampshire, England. 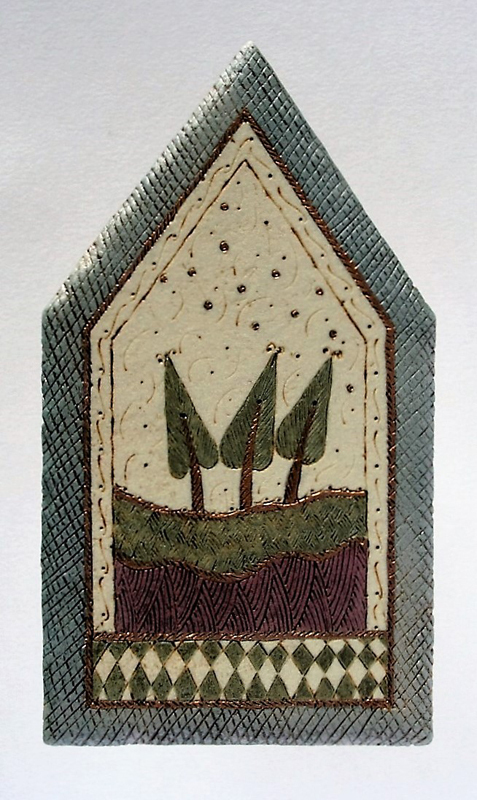 A family tradition of lace making and sewing along with a love of fabrics, textures and patterns has always influenced Linda's work with clay. 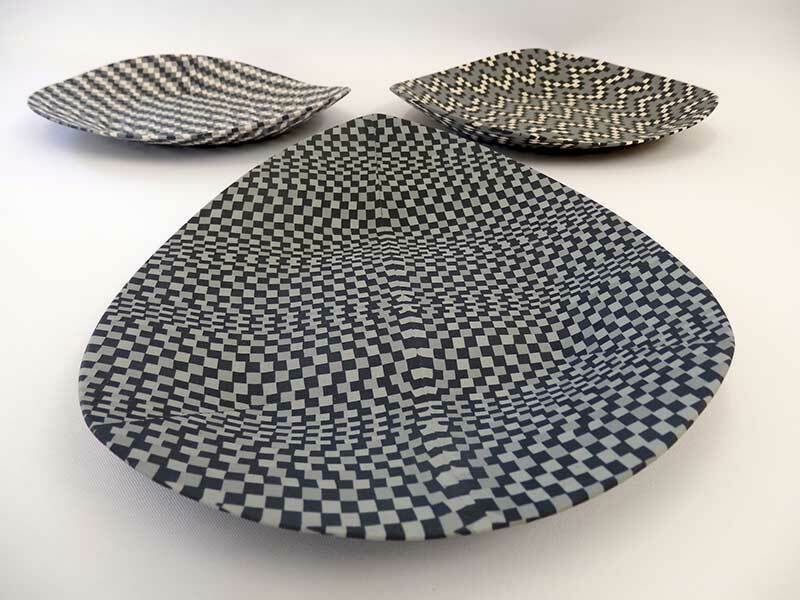 Dishes, vessels, bowls and vases are constructed from soft slabs of porcelain or stoneware clays decorated using wax resist, oxides and a palette of blue and green stains and glazes. 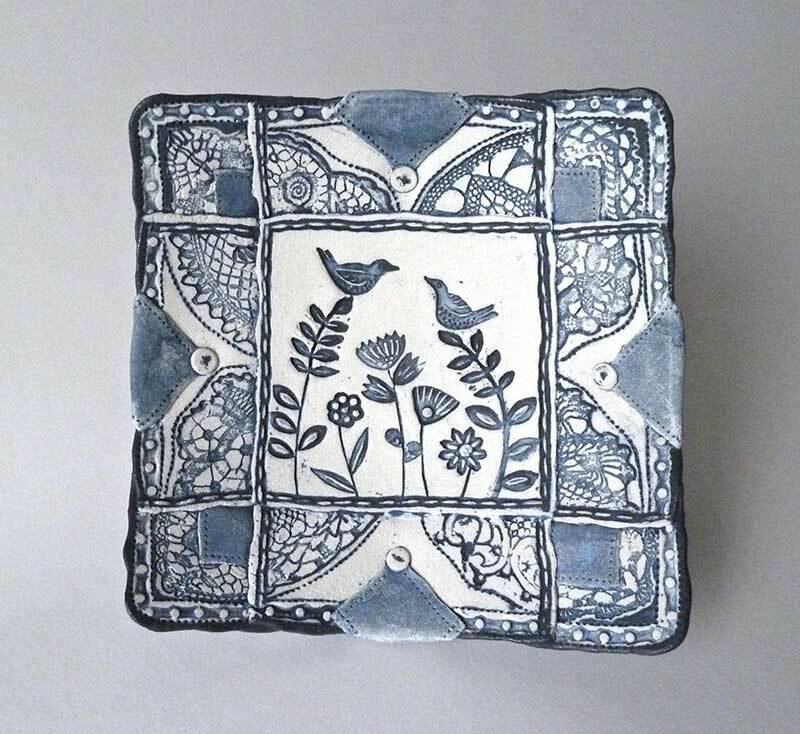 Her own hand carved ceramic stamps inspired by local flora and fauna plus gathered grasses and leaves from countryside, garden and allotment also provide her with delicate silhouettes to add to the final design. 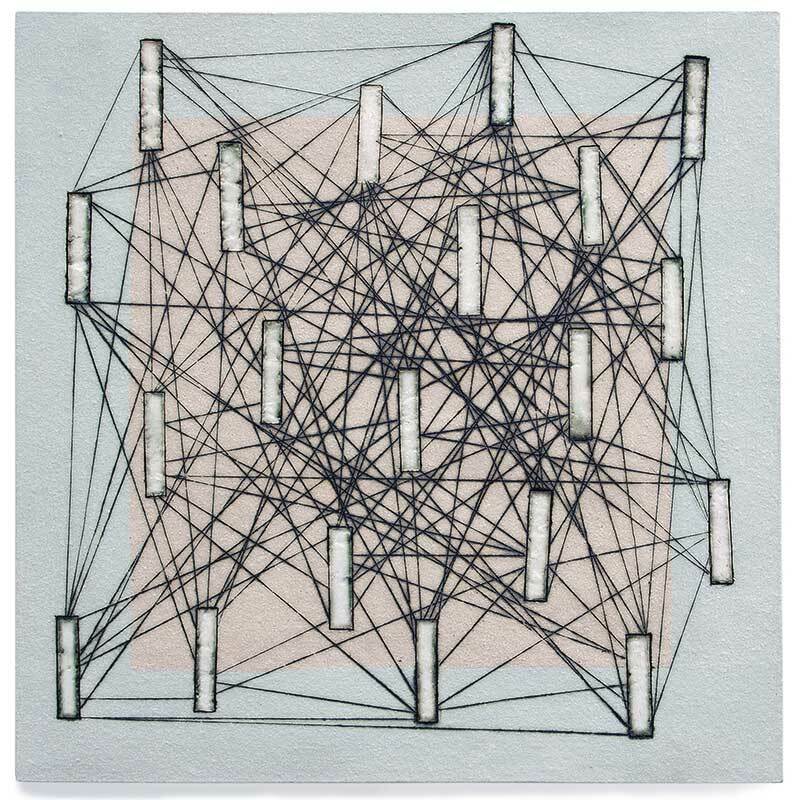 A discipline of drawing everyday and printing with lino has recently led her to begin a new body of work. 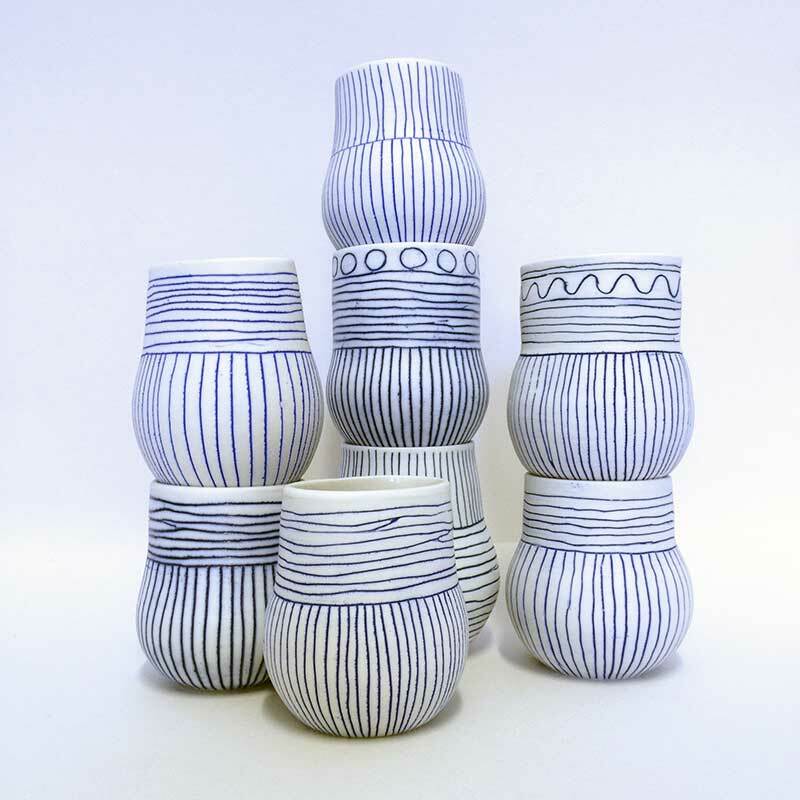 Small porcelain vessels are thrown and decorated with inlaid line drawings to enhance and describe form and shape. As with Linda's slab built pieces, delicate surface patterns and textures add to the impact on the senses, reaching out and demanding to be held and investigated. 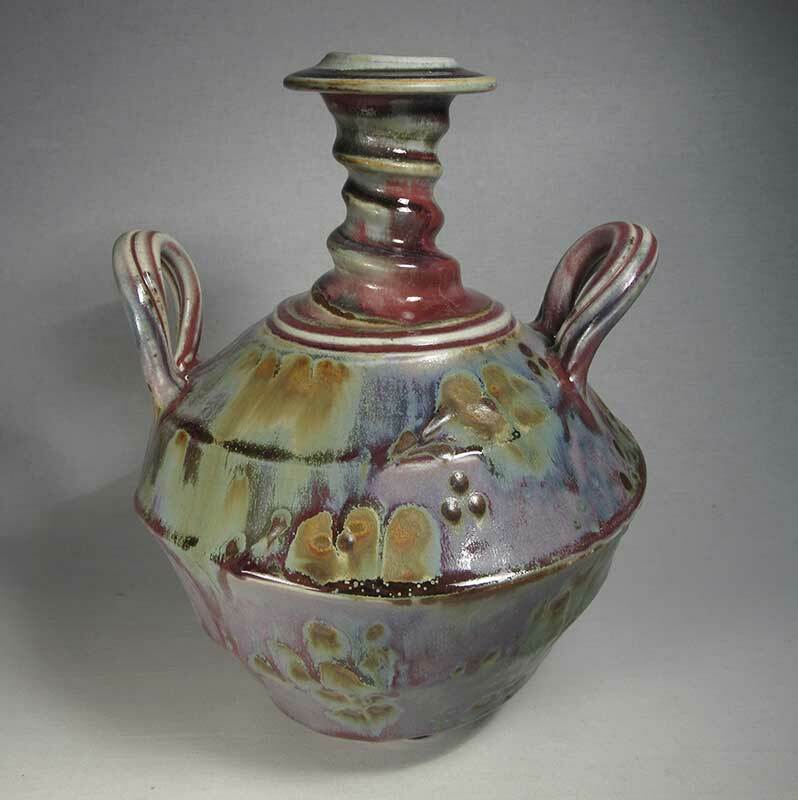 I have worked as a full time professional potter since 1974. 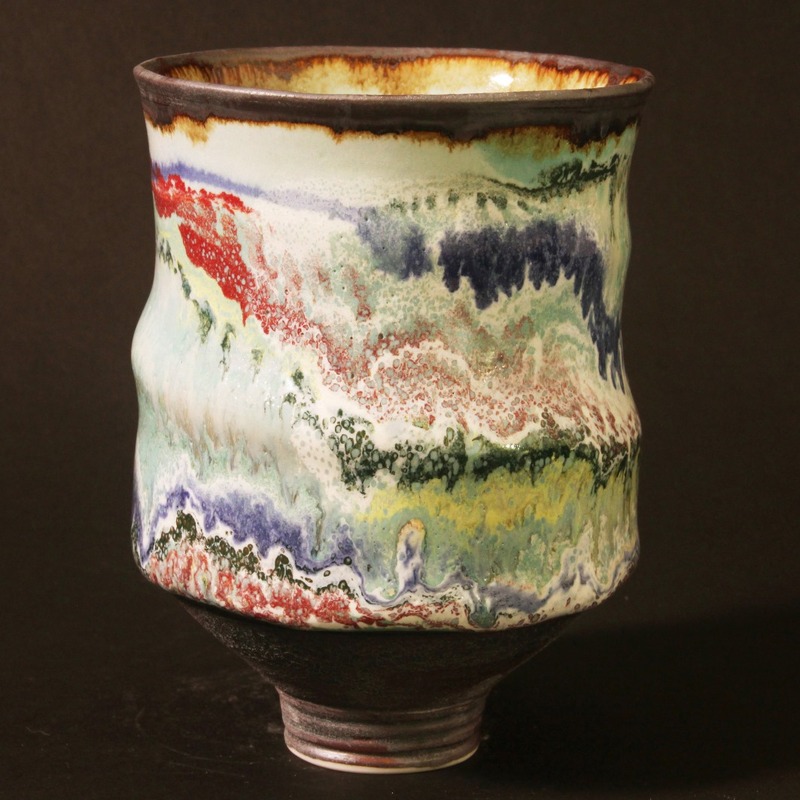 We still make porcelain for use in the home, but since 2001, I have focused on making reduction fired lustreware. 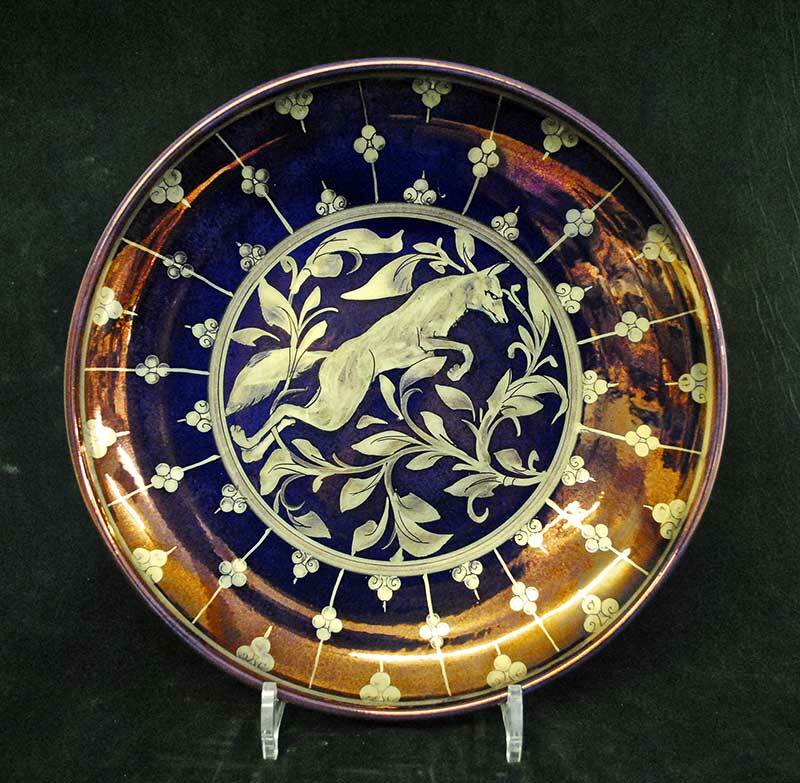 Alan Caiger Smith and William De Morgan have both been important influences on this work. The porcelain we use is vitrified, at 1265C, then given two more firings. The decoration is applied freehand with a brush, using the ancient technique of clay paste lustre. I work with full time assistant Kerry Bosworth, and helper Pasha Manzaroli. Bernard Leach was the inspiration of my youth, but over the years, changing times, fashions and interests have all affected my pots. Now I feel I have found a medium which resonates most for me. Our workshop is near Pevensey in East Sussex, where the showroom is open to the public every day except Sundays and Bank Holidays. 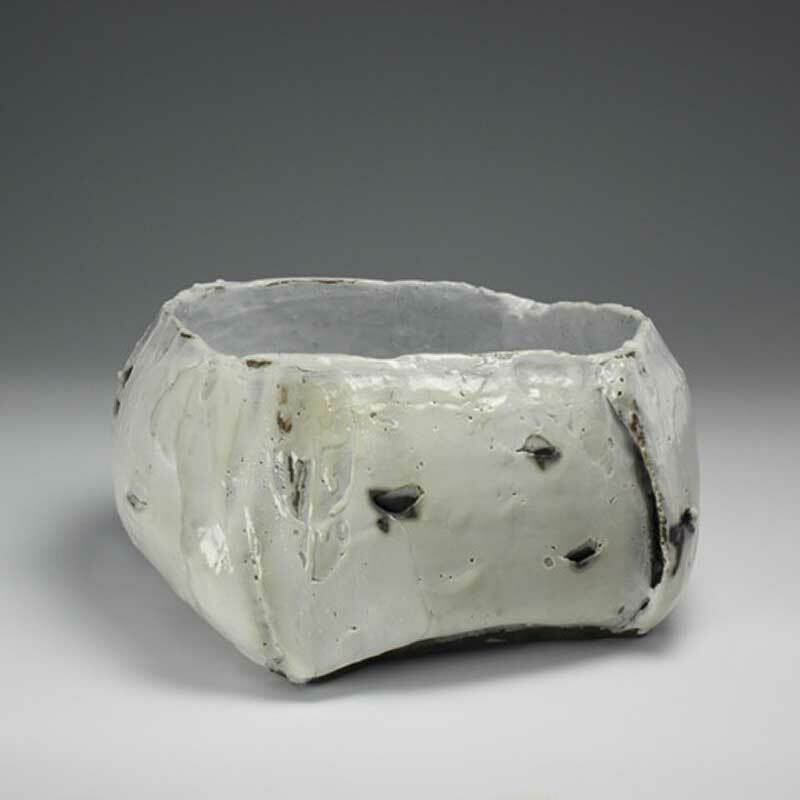 My work is about simple forms imbued with a sense of spontaneity. 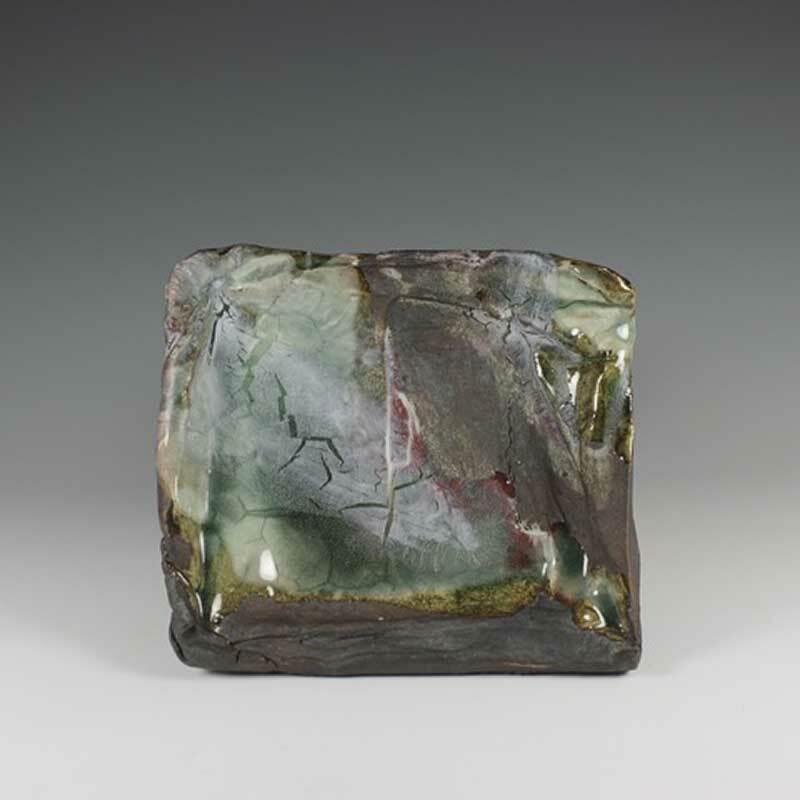 'Raku' as a philosophical approach allows me the opportunity to embrace the element of surprise, seeing and knowing then becoming as important as the making. Roger’s work centres on ideas derived from observations of the sea along the coast near his home – its colours, power, sense of rhythm and depth are of particular interest. Situations and moments observed are distilled to their essence for use in the form and surface. 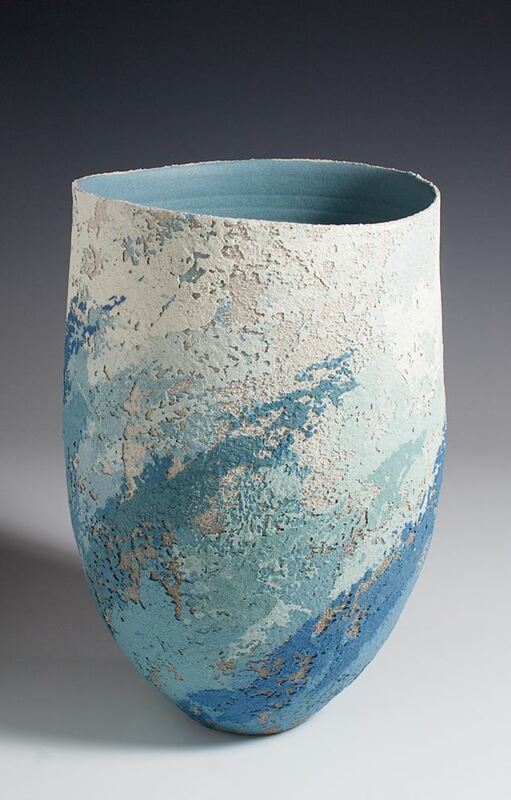 “My work results in various vessel forms, sometimes quite large. I often use various brushed matte and running glazes. 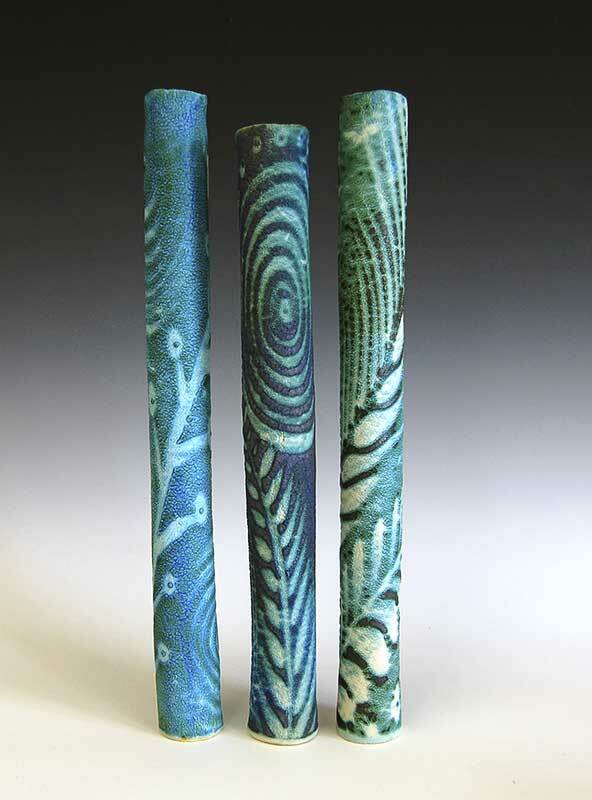 They are intended to interact during the firing and give a strong sense of depth to the surface. All the work is once-fired in reduction, to cone 11, above 1300 degrees. 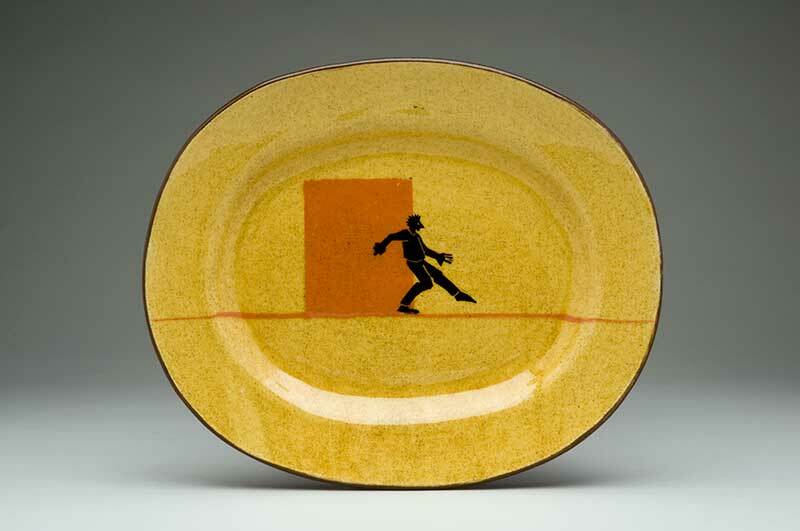 My Individual work is all thrown in porcelain.” Roger’s work is exhibited widely, in the USA, in galleries across Europe and Asia. 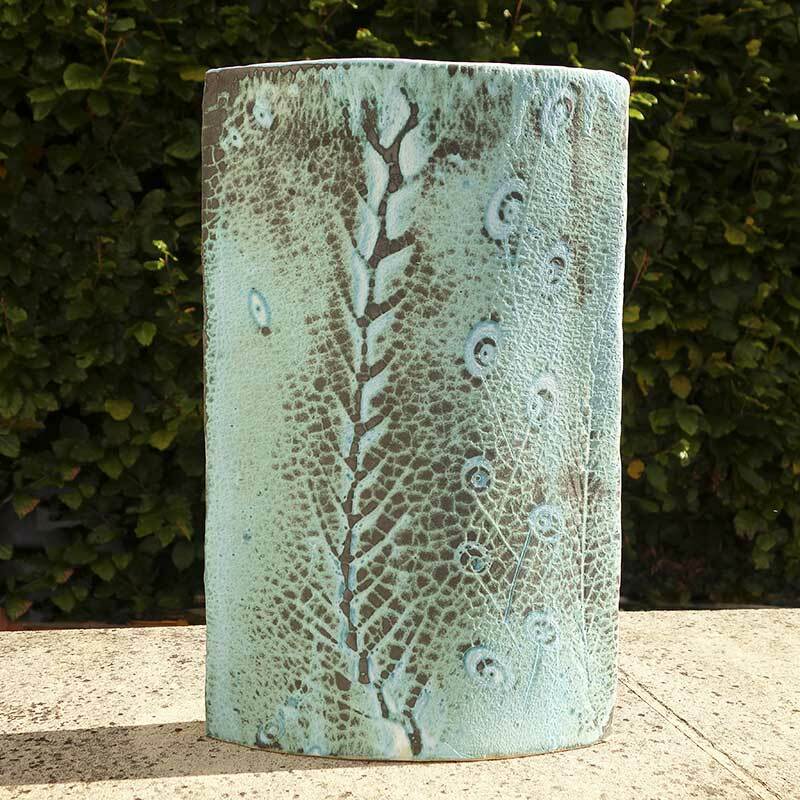 He regularly exhibits at Ceramics Fairs in Britain and around Europe, is a full member of the Devon Guild of Craftsmen and runs a studio and gallery in North Devon. I received a very good training in the Ceramics Department, Wolverhampton Polytechnic and was awarded First Class Honours. The training was formative, we were encouraged to explore and research widely. Afterwards I completed a Post Graduate Course in Art & Design History at Birmingham Polytechnic. This was important to me as I discovered many Artists and Designers whose work interested and intrigued me. Afterwards I was offered a part-time lecturing post (Pottery) in a Teacher Training College in Birmingham. This lasted for three years, I then transferred to the School of Ceramics & Glass in the Faculty of Art & Design, Birmingham Polytechnic where I taught part-time for several years. 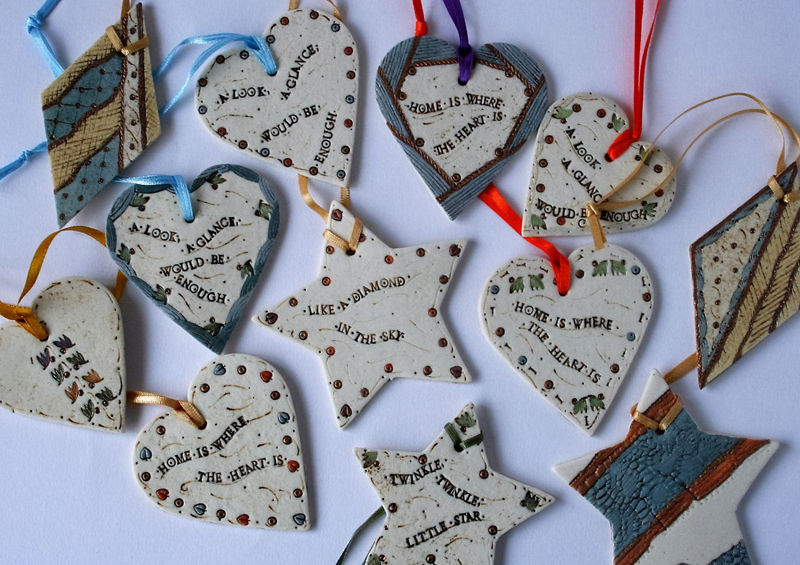 Born in Derbyshire, Jo studied at North Staffordshire Polytechnic and taught in schools and colleges for many years. 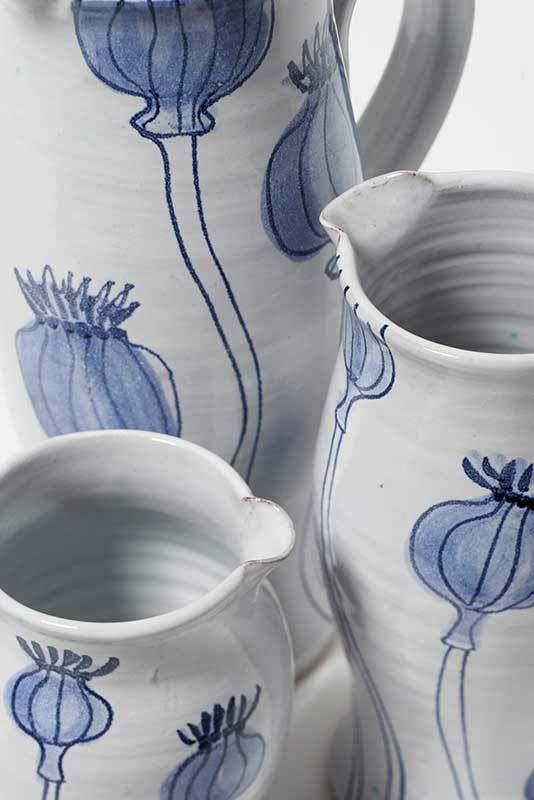 She now teaches occasional short courses at West Dean College in Sussex and gives talks/demonstrations and specialist workshops to various groups, working from her studio in historic Market Bosworth, Leicestershire. She is the author of two books: The Potters Guide to Ceramics Surfaces (2002) and Colouring Clay (2007). A member of the CPA and the Royal Birmingham Society of Artists. 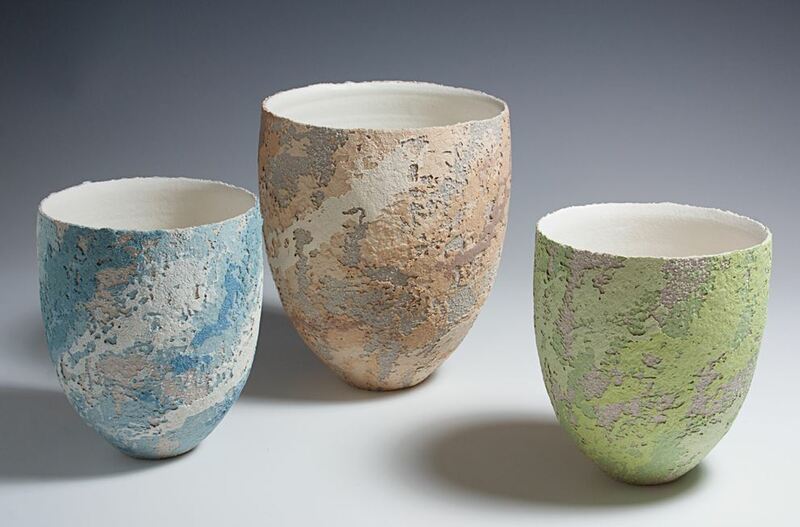 Individual stoneware pots, distinctive for my painterly exploration of colour and texture - forms are wheel-thrown, sometimes altered, in T material/stoneware clay mix. My technique of layering vitreous slips onto the exterior surface is the result of many years of experimentation, which began whilst I studied for a BA (hons) degree at Bristol (University of the West of England). I mix the slips from raw materials with primary stains, which give me an infinite range of subtle colours. Artistic inspiration comes from the effects of light and weathering on architecture and artefacts, together with dramatic land and seascape. Since graduating in 1987, I have exhibited widely throughout the UK and abroad. 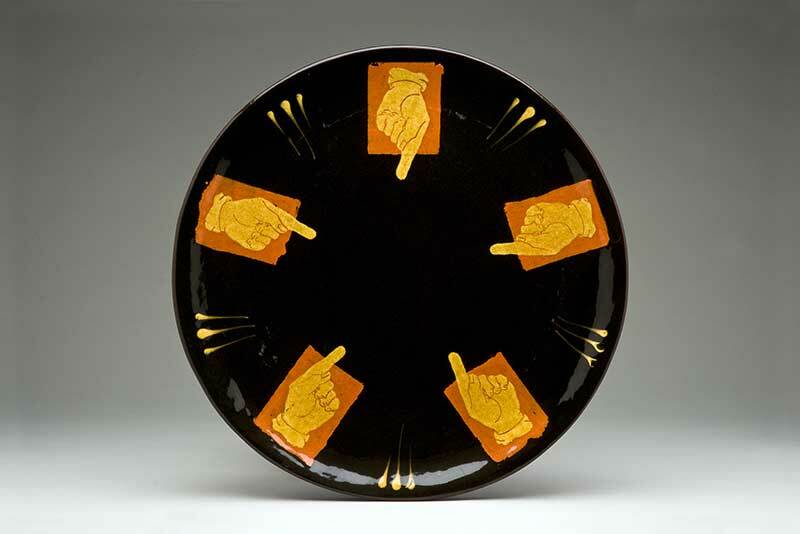 The dishes are slipware, made to be used; they are press-moulded earthenware, decorated with slips and glazed with a food-safe glaze, fired in an electric kiln to 1100 degrees. The ground colour is brushed, the lettering slip-trailed, and the figures etc transferred off newspaper cutouts, sgraffito’d before application to the damp clay. The crispness of the cut paper contrasts with the gentle relief of the slightly raised image, and the soft form of a moulded dish. 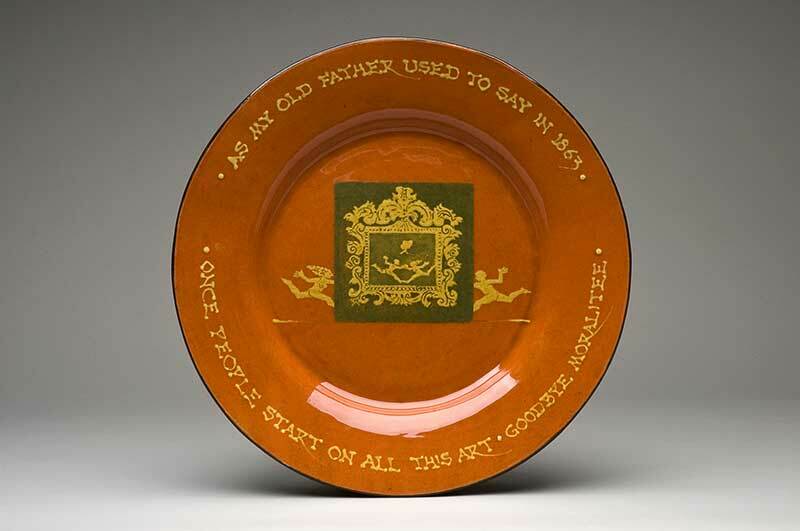 Some dishes are inscribed, the overall design of the dish echoing the sense of the words. The images occupy “flat land”, the limited perspective sometimes working with the two dimensions of the surface, sometimes challenging it. 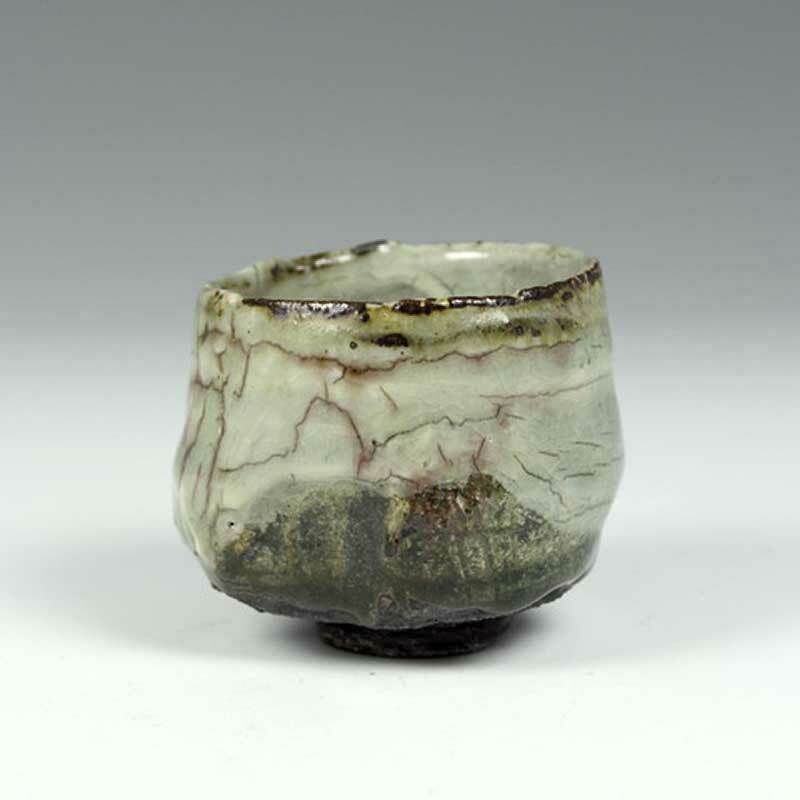 In 1993-5 I lived in Japan and studied ceramics with a Japanese potter. 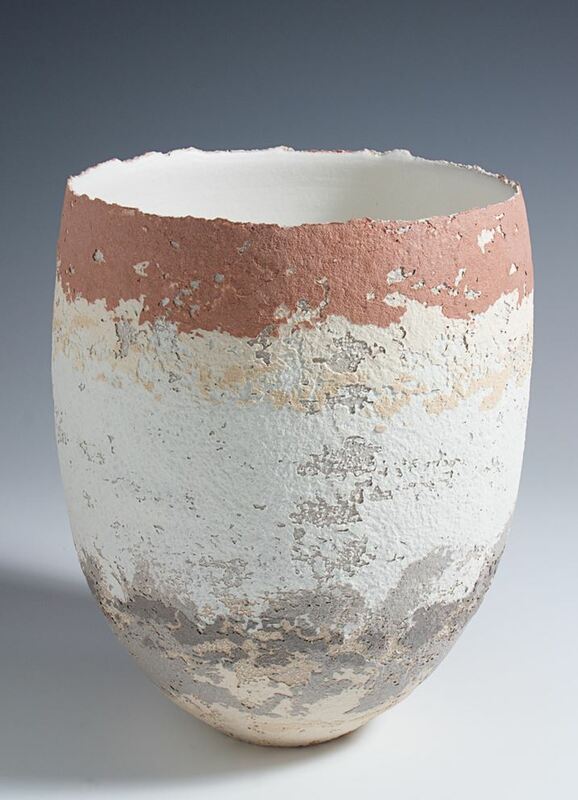 I returned to the UK in 1995 and achieved MA Ceramics at University of Wales Institute, Cardiff. I then set up my own studio in 1997. 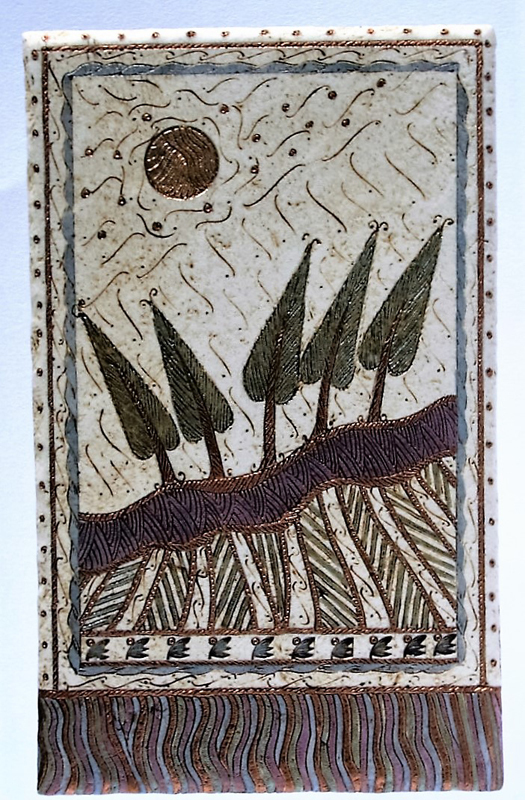 Having come from a painting and printmaking background I was drawn to create ceramic wall panels in a new and contemporary way. 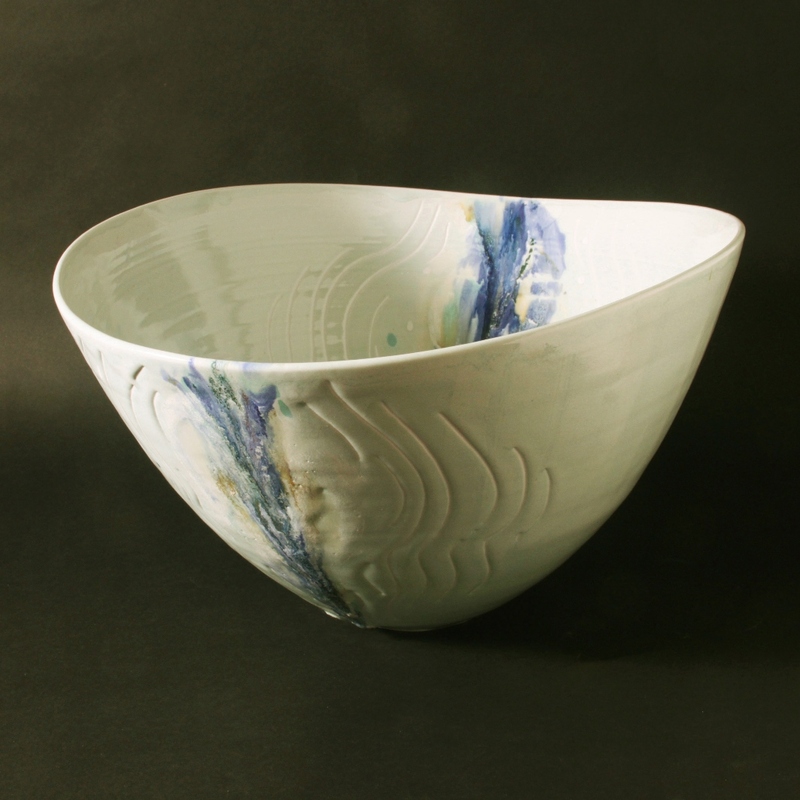 My abstract designs are hand-built with inlays of different types of subtly coloured stoneware and porcelain clays. 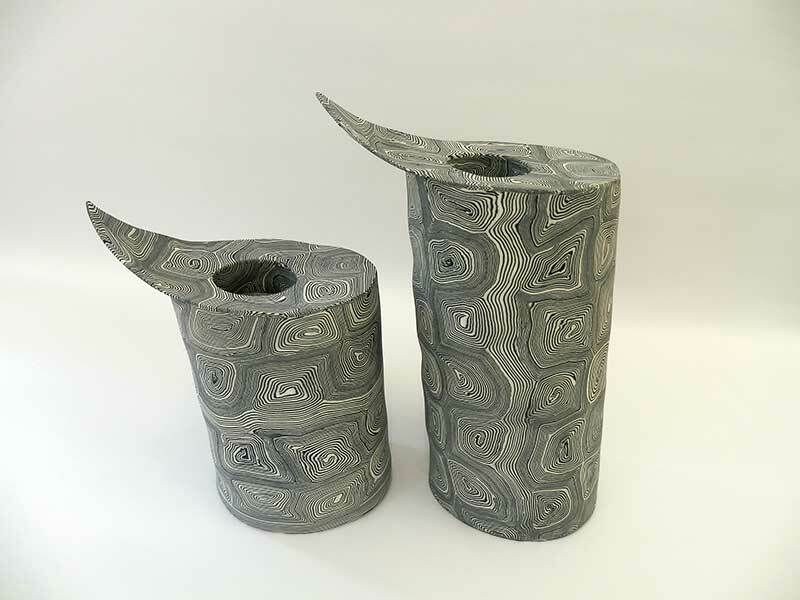 Fine lines are etched directly into the surface and a sparing use of oxides and glaze produces soft, muted colours and preserves the natural stone-like clay textures. 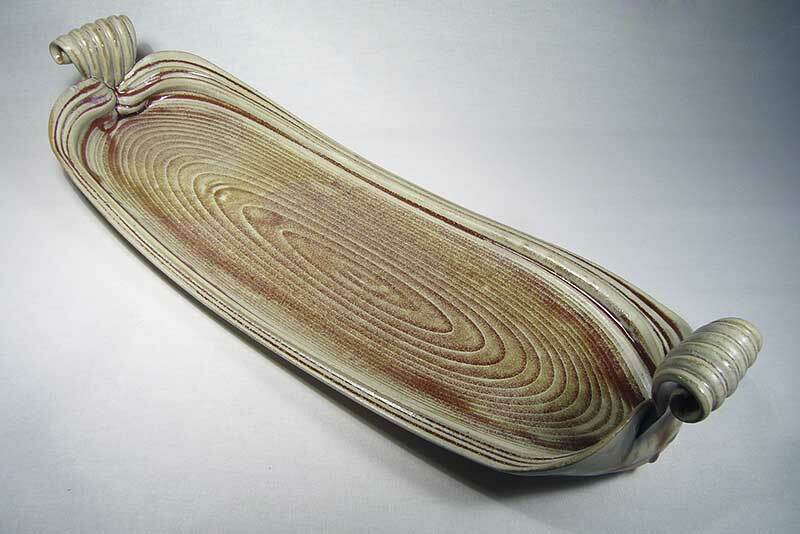 All my work is fired to high stoneware in an electric kiln. I am inspired by rhythmical and repetitive patterns in the landscape. I also reference mathematical patterns, cities and labyrinths. 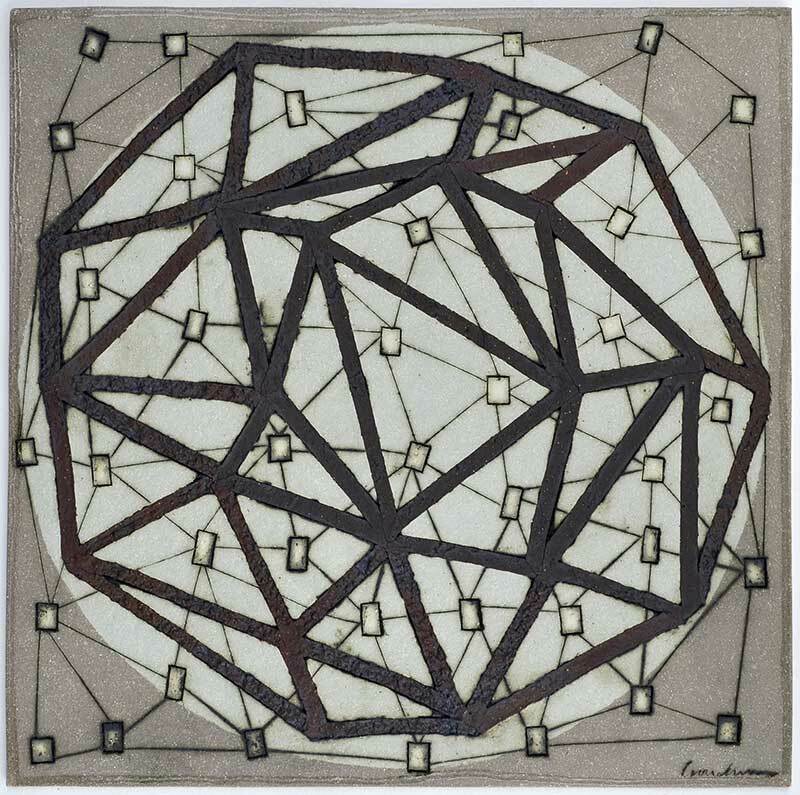 The work is sold as individual panels or as a series. My interest lies with the beauty of imperfection, a beauty that can be born from ageing, from natural decay, from surfaces that have become patinated with wear, weathered or uniquely deformed. I like objects that possess a modest but profoundly confident presence, objects that require a calmness and degree of thoughtfulness from their observer so that the nuances and subtleties of their existence can truly be absorbed and appreciated. When my work elicits such responses from that observer then I have succeeded in my ambition of producing work that emanates a state of wabi-sabi.